2nd Ai Finseth, 1914 Franklin Jr. Ranger	 2nd Joe Thurow, 1967 Chevy El Camino. 2nd Chad White, 1958 Chevy Belair. 3rd Stanley Bourdon, 1960 Divco Model 334. 2nd Doug and Luke Jacobs, 1966 Pontiac GTO	 2nd Mike Kasel, 1951 Ford Panel Truck. 2nd Don and Sue Rosenthal, 1969 Ford Mustang Mach 1	 3rd Anthony Meyer, 2003 Dodge SRT 4. 3rd William Melville 1981, Plymouth Reliant K	 3rd Dave Dam, 1972 1972 Honda Ct90 Sport Rider. Troy Smith, 1971 Chevy Camaro. Adam Hawkins, 2000 Harley Davidson Road King. 2nd Duane and Julie Evanson, 1963 Chevy Nova SS	 Roger and Ruth Summerfield, 2010 Shelby Supersnake. Division K, Body Modifications Required	 Bill Dimmit, 1931 Ford Tractor. Division L, Convertibles	 Jeff and Becca Schreiner, 1911 Buick. 2nd Michelle Lebarron, 1971 Chevelle. 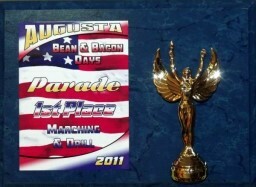 The 2013 Bean and Bacon First Prize plaque with three dimensional angel. See photos of the parade awards by clicking on the award picture. Celebrate the American Independence Day holiday and freedom in the Augusta Wisconsin celebration called Bean and Bacon Days.